KINSTON, NC -- The Texas Rangers announced their Minor League Player of the Month awards for the month of April on Thursday. 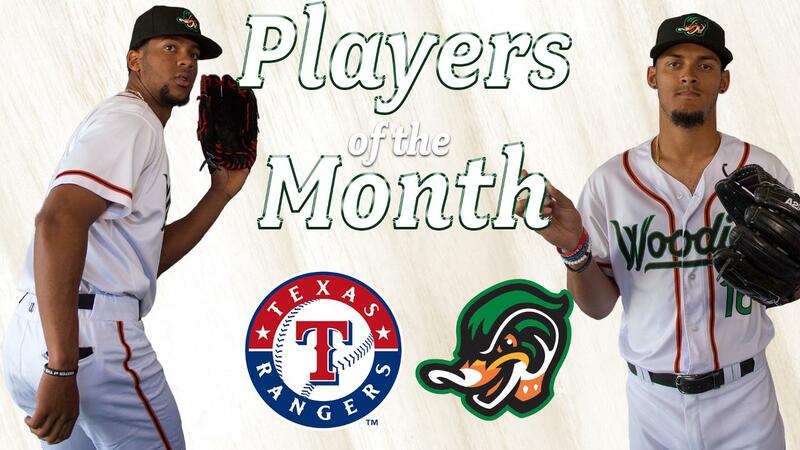 Right-handed pitcher Jonathan Hernandez and center fielder Leody Taveras earned recognition as Pitcher of the Month and Defender of the Month respectively. Hernandez, 21, turned in four starts in the first month of the season with three counting as quality starts. He went 3-1 in April with a 1.61 ERA to lead the organization. He averaged over 11 strikeouts per nine innings pitched to start the year as he accumulated 28 K's in 22.1 innings pitched. He more recently struck out a career-high 11 batters on Wednesday night against Carolina in a 4-2 Woodies win. Taveras, 19, earned his third Defender of the Month award in the last two seasons. The Dominican also won the award for April and July last season with the Hickory Crawdads. In April, made 21 starts in center field to lead the team. He also led the Wood Ducks with three outfield assists from center, twice throwing home to cut down a run. Currently, 35 of Leody's 37 starts have come in center field and the DEWDs are only 1-2 when he's absent from the lineup. In 2017, the Wood Ducks had one starter earn recognition and also swept the Reliever of the Month awards with four different pitchers. Emerson Martinez (June) was the lone starter for Down East to win the award, while Ricky Rodriguez (April & June), Brady Feigl (May), Scott Williams (July), and Jeffrey Springs (August/September) won as bullpen arms throughout the season. The other players of the month for April included current Wood Duck, Melvin Novoa, as Player of the Month for his performance in Hickory. The Reliever of the Month was given to left-hander Brandon Mann with the Round Rock Express and now the big league club.